Cherries (Prunus spp.) are one of summer's greatest treats. They can be grown in U.S. Department of Agriculture plant hardiness zones 4 through 9, depending on the variety, though they have very specific growing requirements, including a sufficient amount of winter chill. Cherries can be divided between sweet varieties (Prunus avium) for eating fresh and sour cherries (Prunus cerasus), which are used primarily for pies, preserves and fruit juice. Some zones favor certain varieties over others. The only cherries that can be grown reliably in USDA zone 4 are the sour varieties. Sour cherries are hardy to -30 degrees, though a few varieties may be able to withstand colder temperatures when they are fully dormant. "Montmorency" and "Morello" are two of the most widely planted sour cherries in zones 4 and up. Some sweet cherries reportedly tolerate zone 4 winters, such as "Van," but these are the exception rather than the rule. The majority of sweet and sour cherry varieties can be grown in USDA zones 5 through 8. In terms of temperature, these zones are ideal for cherries because there is no danger of winter freeze damage and sufficient winter chill is nearly guaranteed. However, other localized climate conditions in these zones may not favor healthy growth and fruit production. For example, cherries are difficult to grow in the southwestern desert climates that fall in USDA zones 4 to 8. In the eastern United States, sour cherries generally are well-adapted, though sweet cherries are prone to fungal diseases in the rainy, humid summers, requiring greater care and maintenance to grow and fruit prolifically. The issue with growing cherries in USDA zone 9 is the lack of winter chill hours. Most cherries require at least 700 hours of winter chill, which rarely occurs in these regions. To be safe, only varieties that require less than 500 hours of winter chill should be planted in zone 9. These include a few popular varieties of sweet cherries, like "Stella" and "Lapin." Sour cherries are unlikely to fruit productively in zone 9. USDA hardiness zones give an approximate idea of where cherries can be grown, but local microclimates also can determine the success of the trees. For example, south-facing slopes stay a few degrees warmer than other areas of the landscape and are the best place to plant cherries in the coldest extent of their range. This can help to avert winter freeze damage, but also increases the summer heat needed to ripen the fruit in areas with mild summers. 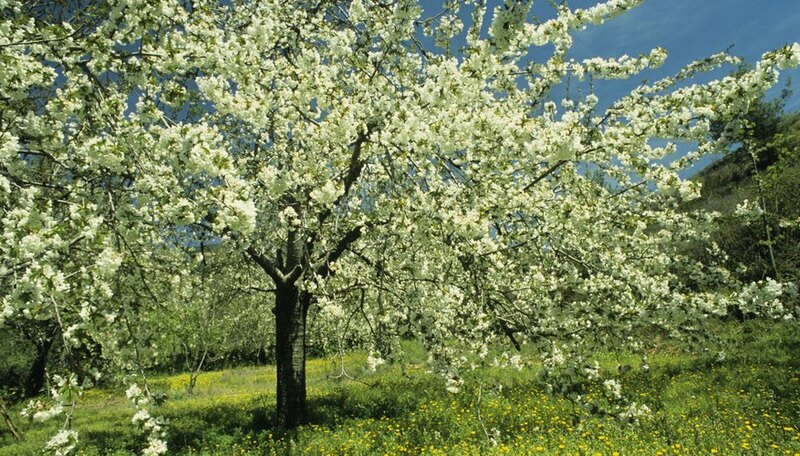 North-facing slopes have the opposite affect and can be a good location for planting cherries in the warmest reaches of their growing zones.